Click photo to watch closing moments of debate. Senator Scott Dibble (DFL) argues a constitutional amendment requiring a photo ID to vote will hurt people, much like last year’s marriage amendment. Senator Julianne Ortman (R ) says Republicans needed to pass a constitutional amendment because Governor Mark Dayton vetoed their voter ID bill last year. 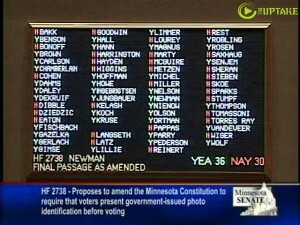 The bill passed 36-30 with only one Republican voting against it. The Senate bill differs from the House version, so it will go to a conference committee.